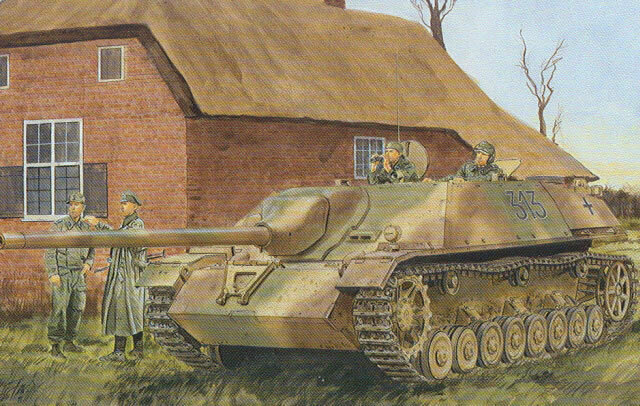 When the 7.5 cm PaK 40 L/48 began to have problems defeating Allied armor – especially the heavy and troublesome Soviet IS tanks and ISU self-propelled guns, the Germans decided to upgun their Jagdpanzer IV to carry the more efficient 7.5 cm PaK 42 L/70 which was the same gun mounted in the Panther. While the marriage was basically a good one, the extra weight and shock of the heavy gun on the suspension caused failures of the front bogie wheels. As a result, later models were fitted with steel-rimmed wheels and heavier springs on the front bogie pair on both sides. Over 900 of these useful vehicles were produced by Vomag (hence the (V)) and another 278 of a different design from Alkett (A), but their high water mark was the Battle of the Bulge with some 137 noted as available. DML last revisited this popular tank destroyer in 1998 with some interim re-releases of modified versions over the years in their “Imperial” series. But this is a new-build kit and other than wheels, tracks and a few generic bits, it is a wholly new model from the ground up. In point of fact, 315 of its major parts are all new. Since the vehicle did not enter production until August 1944, I have no idea how many would have had zimmerit paste but I would think it very few if any. Ergo the “zimmerit or not” question here is a relatively moot point. The model provides a large number of options. Foremost among them is the use of either an early (single cylindrical) or late (twin pipes) Ausf. J rear hull and exhaust. A choice of early or late (post-December 1944) tow hitches are also offered. Three different options for return rollers and eight three-piece steel-rim wheels are also provided for the suspension, as well as modified bogie mounts and a totally new lower hull pan. No engine detail is provided, but a firewall is included as the radio sets mount against it (and they are provided). Engine deck details are similar to those used on previous Panzer IV “Smart Kit” offerings. The complete L/70 gun is provided with a slide-molded gun barrel in one piece, which at least on the review sample did not have sink mark one on it. However, other than the big gun and the radios there is no interior to speak of within the casemate. The skirts are DML’s “Razor Edge” styrene vice etched nickel, but they do provide an easier assembly task so it may not be a bad tradeoff. The fixed skirt sections (Parts B43 and B44) cement in place, but the main skirting simply drops into place on the sides when the brackets are in place. Technical assistance is credited to Notger Schlegendal, Tom Cockle and Gary Edmundson. Eight different finishing options are covered and a small sheet of Cartograf decals is provided for them: 15th Panzergrenadier Division, Western Front 1945 (tricolor, black 313); Pz.Jg.Abt., SS “Feldherrnhalle” Panzer Division, Budapest 1945 (white over tricolor, black crosses); 13th Panzer Division, Hungary 1945 (tricolor, black 333); same vehicle, but white over sand; 9th SS Panzer Division “Hohenstaufen”, Hungary 1945 (tricolor with black crosses); Pz.Jg.Abt. 1, 1st SS Panzer Division “LAH”, Poteau, Belgium 1944 (tricolor top over sand hull); Stu.Art.Brig. 210, Germany 1945 (white over sand, red L01); 7th Panzer Division, Eastern Front 1945 (tricolor, white outline 403).